Palle Dahlstedt and Per Anders Nilsson from University of Gothenburg, Sweden have recently started a research project about various ways of using electronics to enhance/alter musician interaction in improvisation and rule-based music. In this CNMAT workshop we have worked with prototype ideas with a group of experienced Bay-Area based improvisers, with the aim to gather ideas and feedback from the participant musicians. 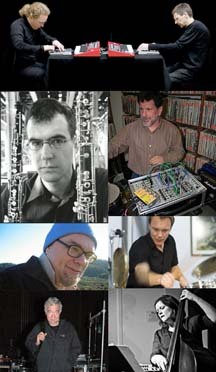 At this concluding concert the group present and performs material from the workshop, in addition to free improvisations. form and freedom,” "a modern day renaissance musician," and "a seasoned improviser with impressive extended technique and peculiar artistic flair." Lisa Mezzacappa is a San Francisco-based bassist, composer, and musical instigator. An active collaborator and curator in the Bay Area music community, she leads her own groups Bait & Switch and Nightshade, and co-leads the ensembles duo B., Cylinder, the Permanent Wave Ensemble, and the Oakland Active Orchestra. She collaborates frequently on cross-disciplinary projects in sound installation, digital poetry, film, sculpture and public music/art. As curator, she programs the annual JazzPOP concert seres at the UCLA Hammer Museum in Los Angeles; the monthly Monday Makeout creative music series in the Mission District of San Francisco; and a music and film series, Mission Eye and Ear, at the Red Poppy Art House. Kjell Nordeson divides his time between Stockholm and San Francisco. Together with saxophonist Mats Gustafsson, he formed AALY Trio in 1986. AALY Trio became one of the leading groups in the Swedish experimental scene in the 90’s. Nordeson has toured extensively in North America, Europe, North Africa and Japan with various groups. He has performed with Peter Brötzmann, Barry Guy, Ken Vandermark, Joe Morris, William Parker, Paul Rutherford, Gerry Hemingway, Frank Gratkowski, Stefano Scodanibbio, and many others. Since 2004, Nordeson has been active in the San Francisco Bay Area’s thriving community of free-improvised, experimental and new music. He regularly plays with musicians Larry Ochs, Jon Raskin, Greg Goodman, George Cremaschi, Scott Looney, Damon Smith, John Ingle, sfSoundGroup, Aram Shelton, Darren Johnston, Lisa Mezzacappa and many others. Tim Perkis has been working in the medium of live electronic and computer sound for many years, performing, exhibiting installation works and recording in North America,Europe and Japan. His work has largely been concerned with exploring the emergence of life-like properties in complex systems of interaction. In addition, he is a well known performer in the world of improvised music, having performed on his electronic improvisation instruments with hundreds of artists and groups, including Chris Brown, John Butcher, Eugene Chadbourne, Fred Frith, Gianni Gebbia, Frank Gratkowski, Luc Houtkamp, Yoshi Ichiraku, Matt Ingalls, Joelle Leandre, Gino Robair, ROVA saxophone quartet, Elliott Sharp, Leo Wadada Smith and John Zorn. Ongoing groups he has founded or played in include the League of Automatic Music Composers and the Hub -- pioneering live computer network bands -- and Rotodoti, the Natto Quartet, Fuzzybunny, All Tomorrow's Zombies and Wobbly/Perkis/Antimatter. David Wessel studied mathematics and experimental psychology at the University of Illinois and received a doctorate in mathematical psychology from Stanford in 1972. His work on the perception and compositional control of timbre in the early 70's at Michigan State University led to a musical research position at IRCAM in Paris in 1976. In 1979 he began reshaping the Pedagogy Department to link the scientific and musical sectors of IRCAM. In 1985 he established a new IRCAM department devoted to the development of interactive musical software for personal computers. In 1988 he began his current position as Professor of Music at the University of California, Berkeley where he is Director of CNMAT. He is particularly interested in live-performance computer music where improvisation plays an essential role. He has collaborated in performance with a variety of improvising composers including Roscoe Mitchell, Steve Coleman, Ushio Torikai, Thomas Buckner, Vinko Globokar, Jin Hi Kim, Shafqat Ali Khan, and Laetitia Sonami has performed throughout the US and Europe. Palle Dahlstedt is a composer, musician, sound artist and researcher. His music ranges from orchestral works to interactive music installations, from theatre music to electronic improvisations and solo pianism. He has been performed on six continents and awarded several international prizes, including the Gaudeamus Music Prize in 2001. He has a thorough training in composition and piano from Malmö Academy of Music and the School of Music at Göteborg University. In 2004, he completed a PhD in creative algorithms for music at Chalmers University of Technology. Per Anders Nilsson is an improvising musician and electro-acoustic composer. In the 70- and 80:s he managed his own bands as well occasionally performed with musicians like Willem Breuker, Anthony Braxton, Karin Krog and John Surman. In 2009 he toured Sweden with legendary Evan Parker with his other band, Beam Stone. Currently Nilsson is doing a PhD project at the Academy of Music and Drama, University of Gothenburg. He has been played at several ICMC conferences, has had commissions from GRM, Paris and he has also been a visiting scholar at CNMAT in Berkeley, CREATE in Santa Barbara as well as CCRMA in Stanford.